"For twenty-three years I have been carrying a weight and for twenty-three years I never knew how I could possibly release it. I had a fantasy I could, that I could help things. As if by doing, by doing some number of good things now, I could make up for doing one very bad thing then. 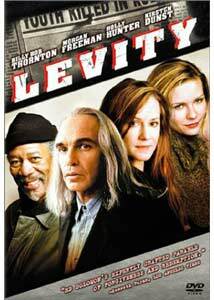 Ed Solomon's morality fable, Levity, is, on the surface, a well meaning film. Telling the story of a convicted murderer haunted by his sins after being released from prison, the film deals with such ripe issues as redemption and forgiveness when they seem all but unobtainable. Unfortunately, it is in other aspects of the script and direction that Solomon allows this potentially powerful film falter. Sentenced to life in prison for the murder of a young convenience store clerk, Manual Jordan (Thornton) unexpectedly receives the news that his sentence has been commuted and he is now a free man. With years to think about his actions, Jordan has come to realize that his life must be met with redemption, which he does not believe will come from God. Jordan begins on a path to help those around him: He first meets Miles Evans (Freeman), a street preacher who runs a shelter for youths where the price for a night's stay is a simple fifteen minute sermon on the virtues of a clean and religious life. Amongst the youths at Evans' shelter is Sofia (Dunst), a party girl whose life is spiraling downward thanks to drugs and a harried lifestyle. The final key to Jordan's puzzle is Adele Easley (Hunter), the sister of the youth Jordan murdered. These three people will help him on the path to redemption while he in turn helps them. There are religious overtones to Solomon's story and while they are rather obvious, the general tone of the script all but eshews these notions. It is clear that Jordan is a sort of Christ figure, given that he moves from person to person while helping each in various ways regardless of his own gain. It is evident that no matter how far Jordan goes in his efforts to cleanse himself of his sins there is the chance that the memories of that fateful day will be with him forever. This is an interesting parable, but it is one that Solomon overlooks in an effort to cram too many characters into a very short amount of time. He fails to do more with his story, which is a pity, because Levity could have been a truly affecting and touching film. While the script suffers greatly from honorable intentions, the look and feel of this film are nearly perfect. Enlisting the help of veteran cinematographer Roger Deakins and editor Pietro Scalia, Solomon and his collaborators surround their characters with bleak, snow-covered streets and darkly lit rooms that effectively convey their emotions. The cast is superior; Thornton offers a very effective performance while Hunter, Freeman, and Dunst all turn in very nice supporting efforts. Image Transfer Review: The 1.85:1 anamorphic widescreen transfer for Levity is mildly disappointing at the start of the film, but overall the transfer represents a very nice job done by Columbia TriStar. Colors are very limited throughout, though those offered come off clean with no bleeding evident. Black levels show some slight grain in parts but overall they offer very nice depth. The largest problem area for the transfer is the overwhelming amount of dirt found on the print. For such a recent film, it is shocking to see such a damaged print. This flaw lessens the appeal of an otherwise fine transfer. Audio Transfer Review: The Dolby Digital 5.1 mix for Levity is largely focused on the center channel, which provides crisp and clear audio throughout with no distortion evident. The surround speakers are used sparingly, while the left and right channels do a nice job of re-creating the musical score and some slight ambient effects. Extras Review: A commentary track by director Ed Solomon, editor Pietro Scalia, and producer Adam Merims is a lighthearted affair with the participants offering useful insight into the making of the film, as well as Solomon's never-ending pursuit to get the film made. At one point, Solomon went so far as to mortgage his house in an effort to push the film further along towards completion. A fifteen-minute featurette is offered and is generally promotional, with interviews featuring the cast and crew. There is little to be learned here that can not be found in the much better commentary track. Finally trailers for Levity, Laurel Canyon, and The Man Without a Past are offered. There is just a small handful of problems with Levity, but they are unfortunately enough to damage the film as a whole. Solomon offers up a high quality cast and crew in his directorial effort, but his script is lacking in the heart it so boldly proclaims it holds.